Residents and building professionals learned how to conserve heritage stonework in workshops hosted by Copeland Borough Council. 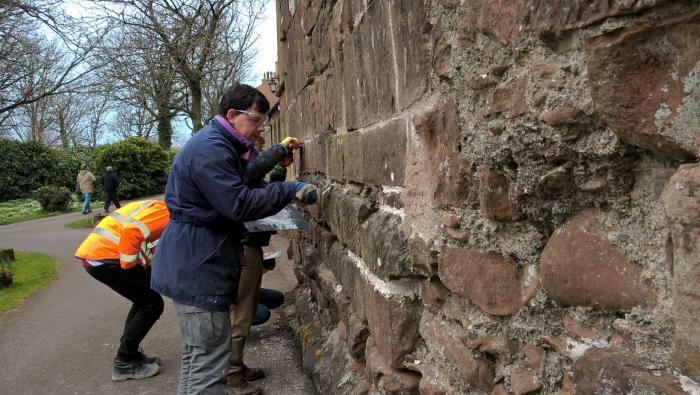 The events, which explained the specialist methods needed for masonry in older buildings, were part of the Townscape Heritage Initiative, funded by the Heritage Lottery Fund, Britain's Energy Coast, Copeland Council and Cumbria County Council. Eight professionals attended a 'masterclass' and 11 members of the public enjoyed a hands-on taster day. They learned about traditional walling, lime mortar, different repair techniques and much more. The workshops took place at St Bees Priory and included work on the remains of the original Lady Chapel. Copeland's Heritage Champion Coun Michael McVeigh said: "We are pleased to be able to help people upgrade their skills through the Townscape Heritage Initiative. It means we can add to the skills base in our local businesses and show our commitment to looking after Copeland's beautiful heritage." William King of William King Brickwork Solutions, said: "I sent three employees and they found it of great benefit. It’s important for professionals to have the right skills to work on historical properties, especially in an area with a rich architectural heritage. The Townscape Heritage Initiative is a five-year project begun in October 2013 with £659,300 from the Heritage Lottery Fund, £394,000 from Britain's Energy Coast, £250,000 from Copeland Borough Council and £50,000 from Cumbria County Council. Grants are made to repair buildings and bring vacant historic floor space back into use, and to provide heritage skills training for builders, and community activities.